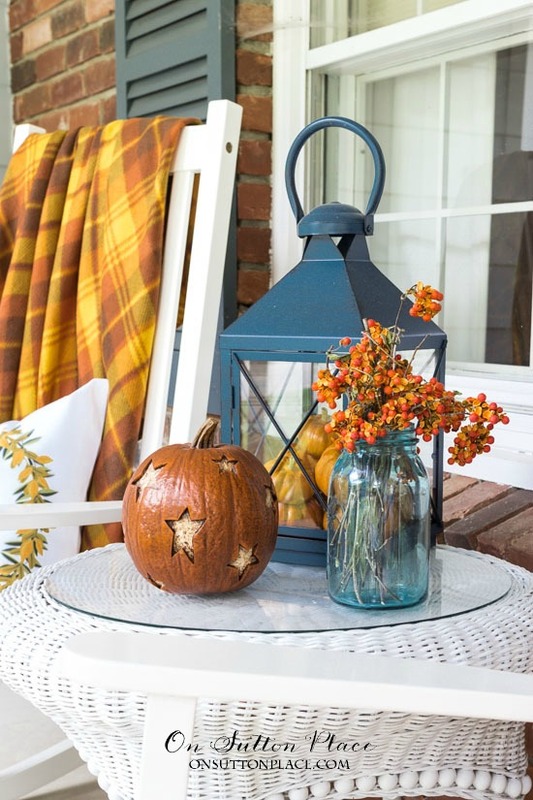 Fall is in the Air…and my fall porch decor is finished! My favorite space, inside or outside, to decorate for the seasons is our front porch. It’s not very big, so I can usually switch over to the next season in an afternoon, or less. Not including the pinecone garland, which took a while, I had my porch dressed for autumn in a few hours. I love how the pinecone garland turned out. I can confess now that I had my doubts! I updated the tutorial with a few helpful hints so if you are curious, just click HERE. I ended up making two garlands because I thought one would be too heavy. The first garland hangs down both sides of the door and the second garland runs along the top. Both are held up with big nails. I am looking forward to showing you what I have planned for Christmas because this is staying up until the new year! I had a late summer, sunflower wreath on the door but wanted something a little simpler to go through Halloween and Thanksgiving. I removed the sunflowers and added orange marigolds. I used twelve stems and inserted them into the wreath like the spokes on a wheel. I bent the blooms out so the wreath would have more depth and show up better from the street. They sort of bob around when the door is opened…which I love. The olive buckets got a quick update with faux pumpkins and bittersweet garland. I’ll be back in a day or two with a short lesson on how to put the olive buckets together. I updated the table in the sitting area by adding fresh bittersweet vine and a wood pumpkin. I ordered two bunches of bittersweet from a seller on Etsy and was not disappointed. I tried to find some locally but had no luck. If you want some, now is the time to buy. 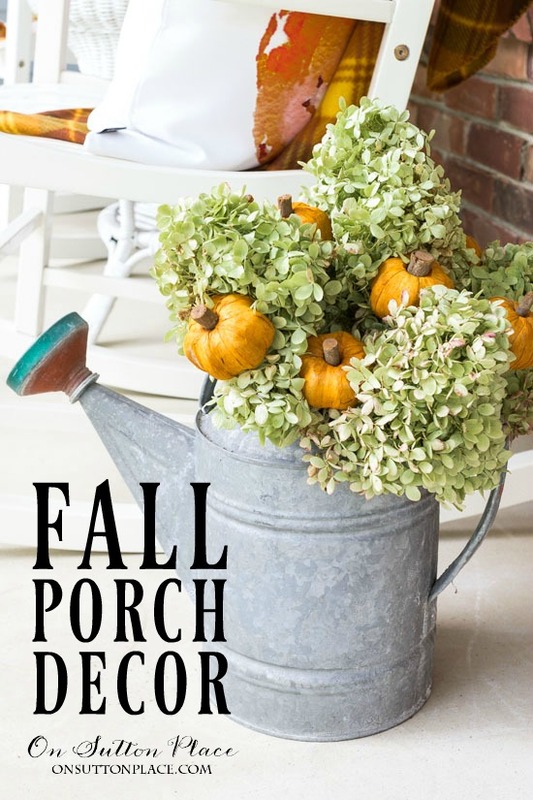 The last thing was adding dried limelight hydrangeas and stick pumpkins to my watering can. Spending time on my porch this past week has been so enjoyable for me. It definitely didn’t feel like work. I sat on a stool and finished the pinecone garland while Kelly hung out in the yard. Being busy and having a purpose took my mind off other things…and the fresh air was good for me. I continue to be grateful for your kindness and support. You have all been so generous with your time and I very much want to give back something of value. I worry sometimes about showing the same old spaces…but at the end of the day, every one of us wants to make our old spaces look new again. If I can help you do that, easily and without too much fuss, then I’m happy…and I hope you are too. 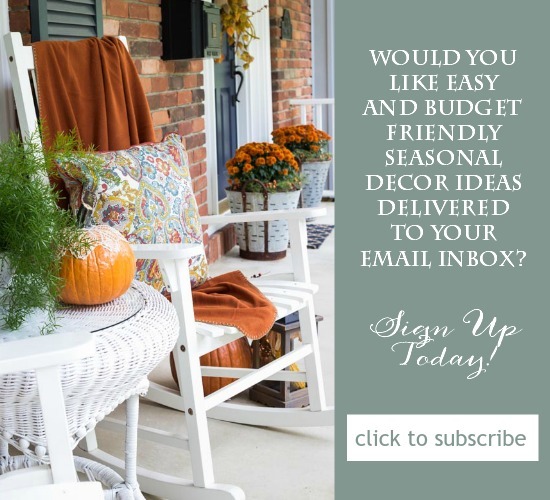 I just found your blog through the Fall Home tour this week. I love it and have found many great ideas with dark wood furniture similar to mine. Love your pup – my Miniature Schnauzer was the love of my life. In addition to the banner which I will hang Sunday night, I am using your inspiration for my front porch. As always, thank you! I’ve only decorated with what I already own this year…or made from things I already have on hand…except for buying apples and squash, which we’ve eaten right from the displays – but your front porch decor is so lovely that it makes me wish I had the extra in my budget to do at least some of it. I like everything that you’ve done – it’s very lovely. I so appreciate how you give the links to the items you use on your blog posts. So wonderful! You are welcome Betty…thanks for taking the time to let me know! 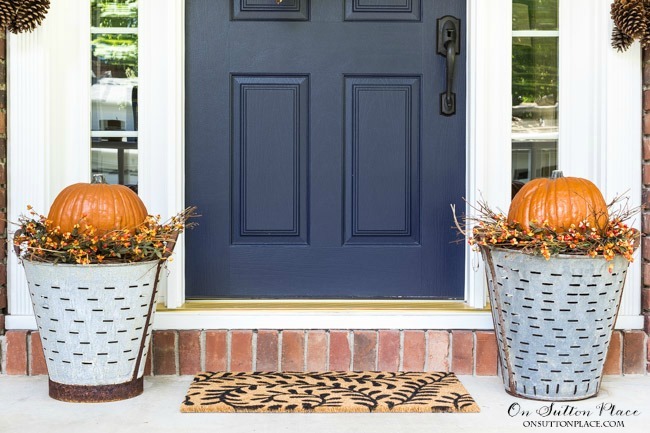 I’m loving your blog and your fall front porch DIY! Your tutorials and links gave me the confidence to re-work my tired fall wreath, leaving more in the budget for other decorating projects, yeah!! I love the resources!!! Thanks so much! Thanks – really REALLY appreciate you listing sources on all this. So convenient, and I hope you make a bit of $$ when we purchase. Thank you for saying that Linda…I don’t make much but every little bit helps! I like the look of your fall porch!!! Love how you coordinated the blue lantern with your blue door. Draws your eye to your other decorations. I am planning to adapt your olive bucket design to my black urns. Love the simplicity, and all I need to get is the bittersweet garland. Too easy!! 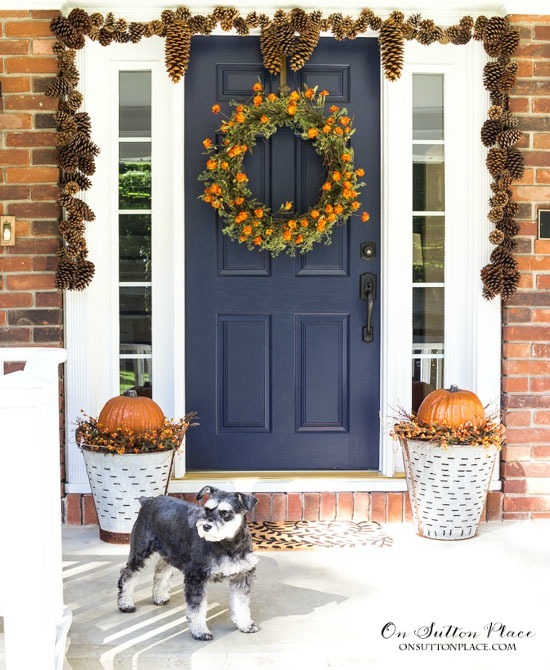 Love the look of this front porch, what a welcome sight! The throw blankets add a nice comfy touch & the marigold wreath is really beautiful. I love your porch. Everything looks beautiful (as usual)! Love the pine cone garlands! Clever girl, Ann! Beautiful – you have such great ideas and taste! Love your posts! Your front door area is especially eye catching. 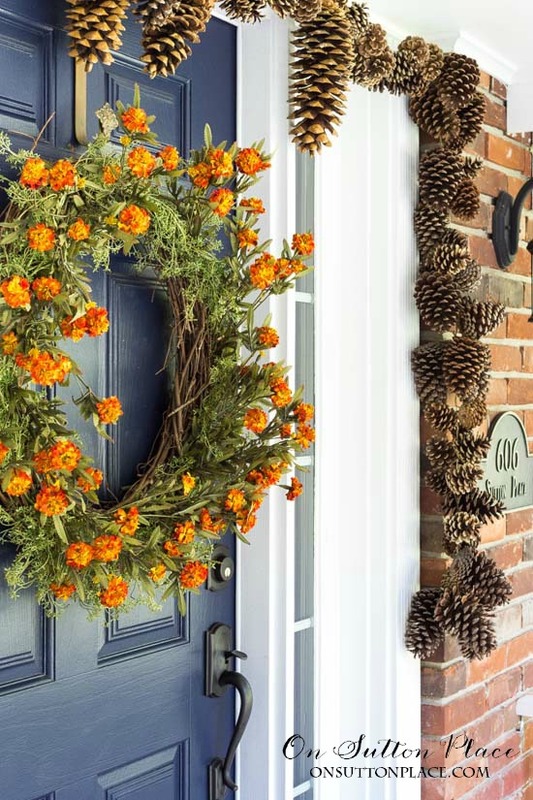 The marigold wreath is beautiful and looks so full. I, for one, love seeing your “same old spaces”! Like you said, we all like to see how others keep their spaces fresh, and you provide that inspiration for me. I hope you have a very good week. I truly believe less is more and simplicity makes for a beautiful appearance and you do that every time! I love your posts and please don’t change anything. Your color scheme is always perfect and I believe that your accessories are reasonable for a typical home. Thank you for your willingness to share your talent!!! So beautiful and in such good taste. I would love to sit on your lovely porch and visit. Thanks for sharing. Like everything, especially the 2 different pinecone garlands -what an ambitious project, but results are worth it. Lovely and in such good taste. Welcome fall. Love your decorations and the colors you chose. It looks like a great place to set in the evenings and enjoy. I love what you have done again.we don’t have an outside space like this at our house not many houses do in Ireland or the UK but if we did I would love to try out your ideas .May be in our entrance hall I could at least put a pumpkin or two.Looking forward to seeing what you do for Christmas . 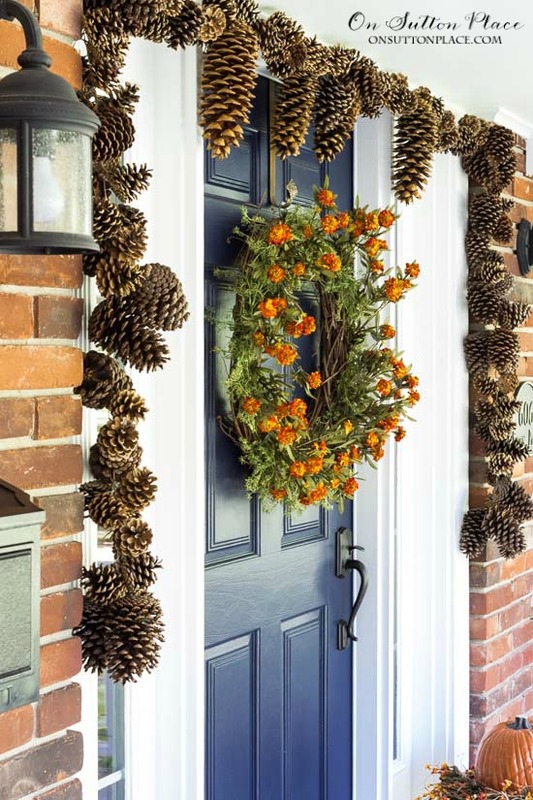 The pine cone garland is beautiful, I love it. Will have to make one! 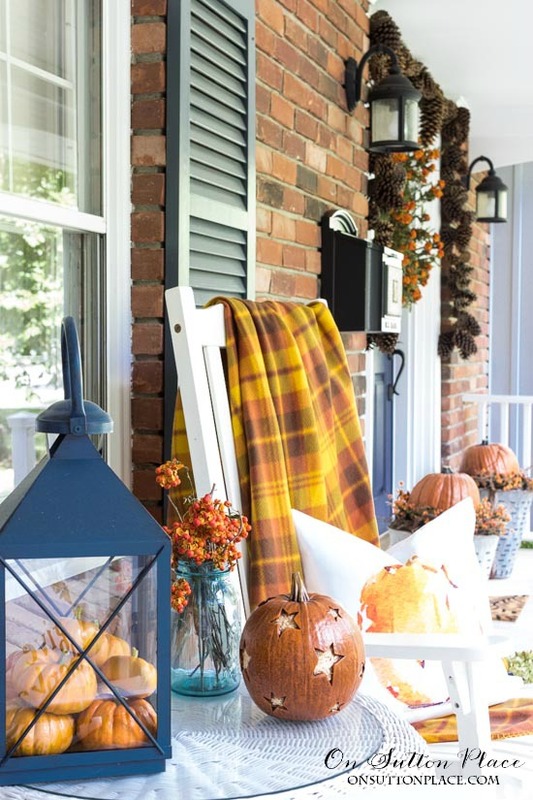 I am becoming inspired to do some fall decorating, inside and out. Great post! Beautiful, Anne! I love the way you decorate your porch. I always look forward to the changes. The marigold wreath is beautiful and looks so full. I, for one, love seeing your “same old spaces”! Like you said, we all like to see how others keep their spaces fresh, and you provide that inspiration for me. I hope you have a very good week. Ann, just put that worry away for good! I love the way you use and re-use what you have with minimal expense and yet make it all look fresh and new! Same old spaces? Never! Please don’t change what you are doing… It’s what I love about your blog and what makes it unique. Even though I don’t have a porch big enough to decorate at all, I still love seeing what you have done with yours and how it changes from season to season. I’m curious about where and how you store all of your out of season decorations. I enjoy making wreaths for our front door and just storing the ones not in use can become a problem when one is short on space. Your porch decor is beautiful and I appreciate so much that you try to keep it simple. I have not heard Kelly mentioned before and that refers evidently to your wonderful schnauzer. Now I know another reason why I have bonded with you and your site: I had a miniature schnauzer, Sophie, who I adored. She is no longer with me but she was VERY special and taught me so much. It’s wonderful you have your schnauzer. Thank you for all you share with us. Your ideas and thoughts are an inspiration, especially for those of us with small but important porches! We don’t really have wraparound porches here in the UK. We should ! I love sitting on the porch at Crackerbarrel when I come to the States. I love your posts and ideas. Your blog is something I look forward to. Such a welcoming fall display; very pretty!! Your post today is great! I haven’t decorated my front porch yet, but you have inspired me to get moving! My porch is very small & I don’t have space for even one chair, but I do decorate the door & on either side of it. That’s my project for this afternoon! Have a great week! I’m looking forward to your next post! I love the deep burnt Autumnal orange with the dark blue, so beautiful. I wrapped a Fall garland around an old grapevine wreath for my front door, nice and full looking and easy! 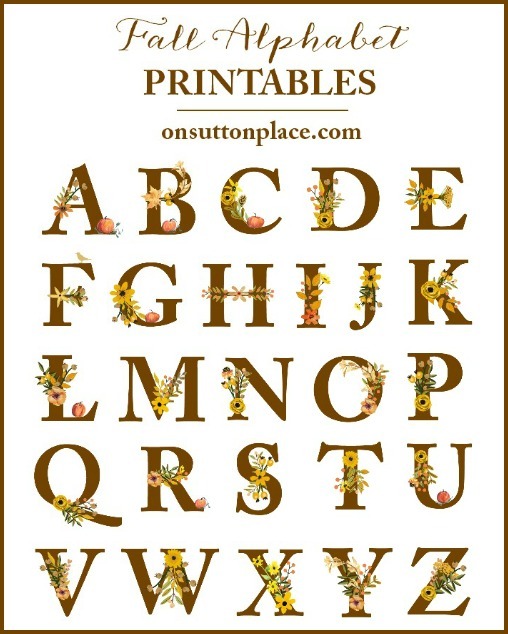 Absolutely love marigold wreath! Great idea. Ann your porch is beautiful and I never tire of seeing it with different seasonal looks. I haven’t even decorated our porches yet. Pumpkins are still in the fields and faux ones blow away. Pinning! Your porch is outstanding, Ann! Well, I am just hitting the high spots this year with fall decorating. We have had 87 days of temps over 90 degrees and I just can’t wrap my head around the change yet. Hopefully our weather will change soon and then maybe my mood will get me going! I love fall— the colors, the smells and the festivals! I would love to sit with you on your porch and have a cup of cider! Have a beautiful fall!! I like your “same old spaces” and enjoy seeing each change. It’s like sharing chat of a new dress with a friend as one sits on their porch. 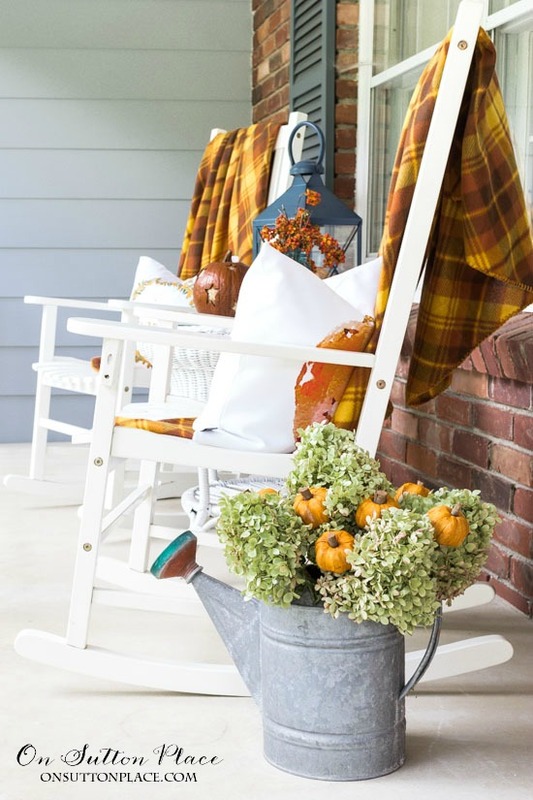 Your fall front porch is lovely. 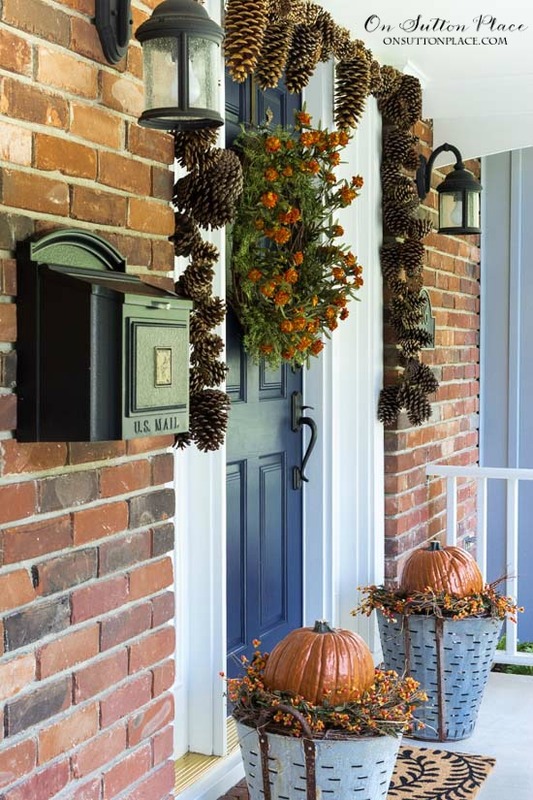 I haven’t begun decorating fall on my front porch, but you have given me ideas to use when I decorate this week. Your pine cone swags are a hit. I spent time making a large pine cone wreath several years ago for my front door. It was lovely. I don’t have a front porch, more like a stoop, but you’ve given me some great ideas for updating the way I decorate. This is beautiful, Ann!! I love the garland, and everything goes together so well. Your decor is always lovely, and I love your tutorials and just used one of your free printables to decorate an old beat up wood cake plate. You can come over and see if you like. Have a great Sunday and week! You always inspire me and I thank you for that and the friendship of sharing. I plan on changing our my front porch and door this week. I looked yesterday for things to help me when I wad out shopping. Did not find what I need. So this morning’s help from you I realize I have what I need right here at home. Keep up the great work you do and the insuring ideas you share. Beautiful porch. I love the colors of the fall and pumpkins. I started decorating for fall the 1st of Sept. It is such a beautiful season. Waiting now for foliage to be at its peak. We are blest!